Anti-reflection coatings are offered to reduce surface reflections to a minimum. Two types of broadband coating are offered. A single layer of MgF2 on Fused Silica or BK7 reduces reflections per surface to about 1.5% over a broad bandwidth. 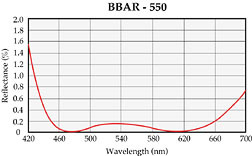 If lower reflectance is required a multilayer broadband coating will provide an average reflectance less than 0.5% per surface. Other wavelengths are also available upon request. Please specify.